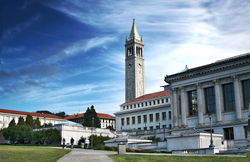 Gethen spent nearly five years working at the University of California, Berkeley, first as a contract and grant assististant, creating the Sponsored Project Office's first web site. They went on to become a tech support specialist and web developer for the College of Letters and Science, managing the departments Apache web server and leading the web design team. In 1995 Gethen was nominated for a Distinguished Service Award and took one home in 1996. Gethen's stint in education didn't stop there. They spent the next ten years as a web developer for the University of California, San Francisco. Starting as a webmaster for ITS Customer Support, Gethen received a Special Performance Award in 1999, 2002, and 2004. Gethen went on to become Senior Web Developer of UCSF Public Affairs where they provided programming, system administration, video and audio production and editing, and podcast hosting for the main UCSF Web site along with several other sites maintained and hosted by the department. Under Gethen's instruction the weekly Science Café podcast received the 2008 Association of American Medical Colleges Award of Excellence for Web-based Electronic Communications. They finished their time at UCSF as an Applications developer for the UCSF Library and Center for Knowledge Management. All information for Pax Ahimsa Gethen's wiki comes from the below links. Any source is valid, including Twitter, Facebook, Instagram, and LinkedIn. Pictures, videos, biodata, and files relating to Pax Ahimsa Gethen are also acceptable encyclopedic sources. Other wiki pages related to Pax Ahimsa Gethen.